Knowing current events surrounding your favorite cryptocurrencies is the key to being a successful cryptocurrency investor or trader. Getting to know “first” keeps you ahead of your game. Most dips and rallies are a result of excellent and unfavorable news around an asset. Quite simply, you need the best available cryptocurrency news app. But worry not, we’re going to show you exactly which ones are the best so you don’t have to waste your time trying them all. Now, in the days of smartphones there are no excuses for not being up to date. So enjoy our curated list of the best platforms around where you can get the most up to date Bitcoin, alternative currency, and blockchain news in one easy to find place (and so you can avoid having 40 open tabs). The following news aggregator platforms are all you need to make wise investment decisions this 2018. 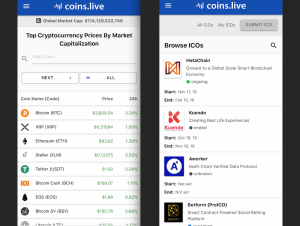 The Coins.live app is available on both Android and Apple platforms, and is your go-to app for all things crypto. You can use it to track real-time cryptocurrency prices, and stay up to date with the latest news. The app also has a portfolio feature where you can set up and track your investments. The team has recently pushed an update that gives you access to an ICO calendar. Looking for where you can follow coin prices, get current news events, and keep track of your portfolio value all in one place? This cryptocurrency app might be your best choice. Its simple to use interface makes it easy to toggle between the three sections of the app smoothly. It’s market section lists all cryptocurrency prices and ranks them by market cap. The portfolio section is probably the easiest to use in the market. You are only asked to enter your coin name and the quantity of it you own; then it does its magic. Updating your prices to market prices and telling you how much you are worth at every moment. The news section also displays current events from best cryptocurrency news sources around the world. Read from Crypto Coin News (CCN), Coin Desk, Coin Telegraph, Use The Bitcoin, and more. The app can be downloaded from the Google Play Store and used for free, with no hidden fees. 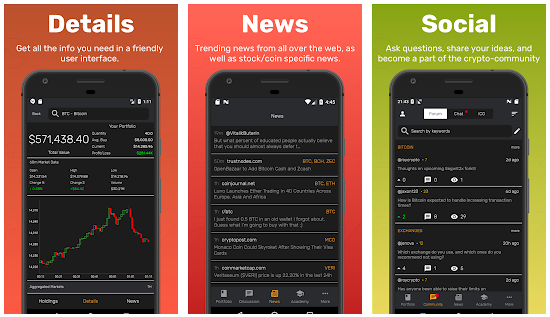 Another excellent app for getting all your cryptocurrency news all in one place. 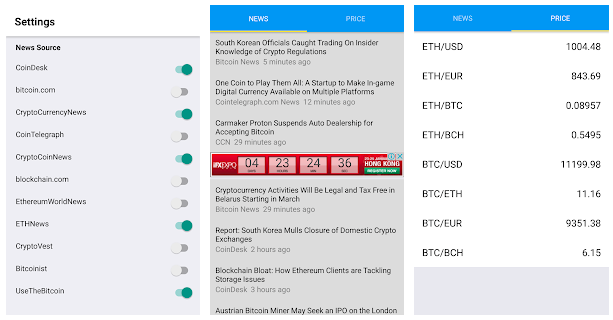 With the All Crypto News app, you have the option of choosing what site you want to read your cryptocurrency news. All Crypto News also keeps track of few coin prices in USD and EUR. 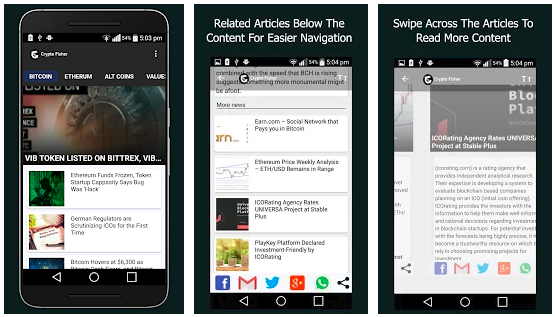 With you not having to remember which site to visit, just having the All Crypto News app gives you a head start to react to market conditions as quickly as possible. 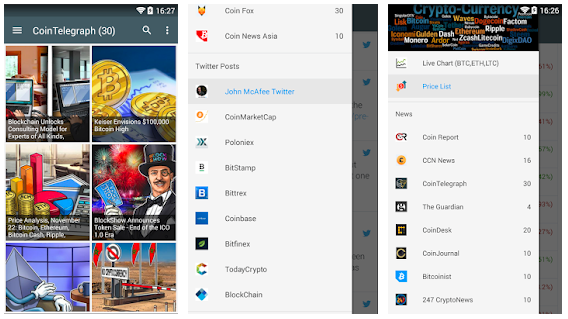 Another simple to use Cryptocurrency News and Tips app for Android mobile phones. This app goes one step ahead to give all you need to know in one place. The app features the best cryptocurrency news sources in the industry. With over 30 best cryptocurrency sources, you can get an update on all that’s happening with every coin. With Cryptocurrency News and Tips, you also get options for getting to know what ICO is currently active. This could be great information for those who get into projects when it’s very cheap, most times at the ICO stage. The Crypto Crunch app happens to be a popular cryptocurrency news app with a high rating on the Google App store. The app updates users with current news in real time. The app brings you instant cryptocurrency news updates, updated coin prices, and best cryptocurrency market analysis from top experts in the industry. Great for crypto traders and investors, giving them day-to-day cryptocurrency news from best sources, making them avoid common trading mistakes and getting users first-hand information that gives them a great head start. Looking for a perfect cryptocurrency market companion to receive timely information on Bitcoin and other alternative cryptocurrencies, Crypto Crunch app is one of the best choices. This app brings you the latest updates in the cryptocurrency world. It uses news feed from various sources to get users latest news about Bitcoin and other alternative cryptocurrencies on one app. The app groups updates by platforms, making you quickly read from the platform you want at any time. It also filters seen from unread news updates, so you don’t get to read the same news twice. On this app, you also get a detailed analysis of cryptocurrency prices and daily volumes. The Bitcoin News & Cryptocurrency News is free to download and can be downloaded here. This is a one-stop app for all your cryptocurrency needs. You can get every information you need, from the news to forum discussions, to getting proper education on cryptocurrency investments and so much more. The design is stunning and can be easily understood by newbies. On this app, you can read cryptocurrency news, monitor market prices, manage your cryptocurrency portfolio, and discuss with likeminded people on cryptocurrency matters. If you are looking for a place to have all your cryptocurrency needs met, then here is the app you need. The CryptoCoin News is a cryptocurrency app that brings you updates from a wide range of top cryptocurrency news platforms. It also gets twitter updates regarding cryptocurrencies for its users. Aside from the news, you also get to see price charts of various cryptocurrencies and details about various ICOs. To follow all news and resources from around the world, or find all analytics in one place. Download this app. 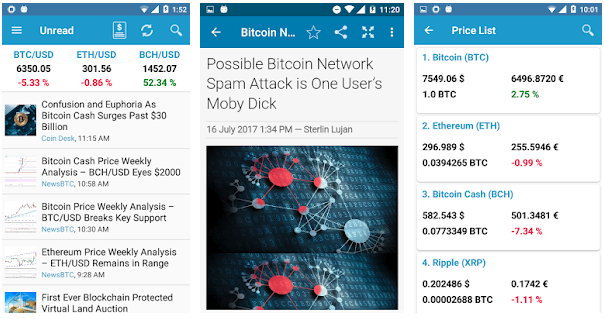 The CryptoFisher app is a more organized app for cryptocurrency news. It groups updates by coin categories. So if you want to read updates on Bitcoin, you can read them all in one place. The simple to use and a lightweight app is straightforward to operate for beginners. Its push notification feature alerts users promptly when a viral update is posted. With feeds from best cryptocurrency news sources and r/Bitcoin, this app delivers timely news to its subscribers. Bitcoin News brings the latest news from the cryptocurrency world. They filter top trending stories, only those that matter and deliver to their users. There’s also a ticker for BTC, ETH, and ZEC tickers for your convenience. The app frequently updates from sources like Bitcoin.com, Coin News Asia, Coin Telegraph, and more. The latest update of this app temporarily stops updates when your battery goes lower than a certain percentage. 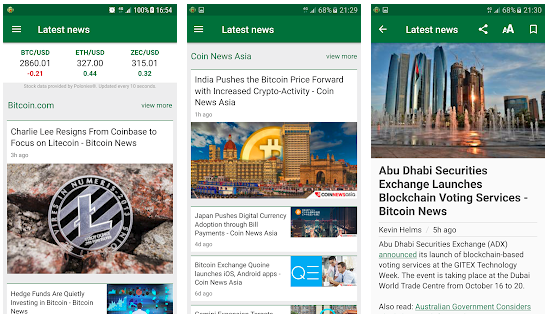 Bitcoin News is another excellent choice when thinking of an option for a cryptocurrency news aggregator software for your mobile device. 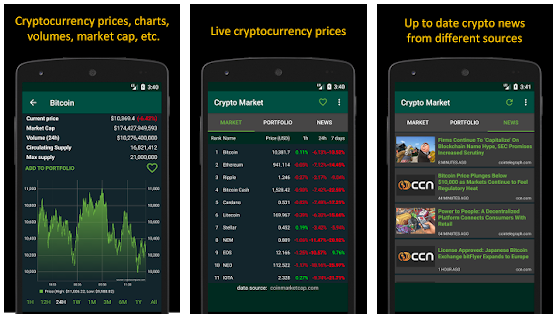 Lastly, the Cryptocurrency Market Data app will be another highly recommended app. One super feature of this app is its ability to trigger to set market prices. This feature is useful for day traders and investors as well. It alerts users when the asset price crosses set figures by the user. Aside from that, you also get all essential features of a news aggregator site. Get news delivered from top cryptocurrency sites down to the app in real-time. With this app, you can watch favorite coins and see how they are doing at a price over time. Cryptocurrency aggregators platforms don’t necessarily have their news to deliver to users most of the time. But most of them, like the ones we’ve listed above, are permitted to promoting articles from top cryptocurrency news blogs in the world. With some apps having some extra features, making investment decisions have been so much more comfortable than it used to be. Users can follow events, see prices, and even chat up with other cryptocurrency enthusiasts all in one app. This brings users a whole lot of relief from having to monitor from different sources.